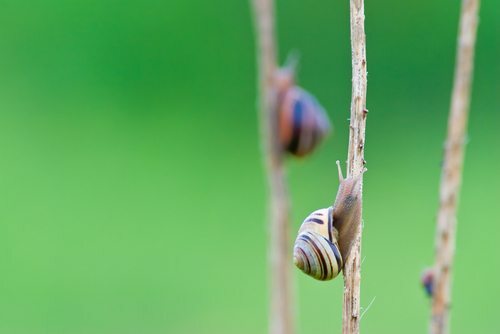 If there is one takeaway for most nonprofits from this year’s Giving USA Report, it is that many nonprofits will be acutely feeling the effects of the recession for many years to come. This is unhappy news for many groups who may already feel that they have had to cut into their musculature to survive. But before we address the numbers, we have one caveat: not everyone will feel the worst effects of this recession. Some organizations have done extraordinarily well over the past few years, but that is precisely what makes these numbers bad news for many. When the charitable giving numbers are relatively flat and some nonprofits are doing extraordinarily well, conversely, that means some are doing much worse than usual. Thus, we see some groups failing either because they are in a troubled field, or because they are in an economically troubled geographic region, or because they never had much to spare to begin with and the recession has rendered them too spare to survive. Patrick Rooney, executive director of the Center on Philanthropy at Indiana University, is quoted as saying that this is the second-slowest giving recovery from a recession since 1971. That may be true in terms of proportion of dollars gained back, but as a measure of the time it will take to regain what we have lost, this is the slowest recovery that we will ever have experienced—by far. Rooney suggests that, at this trajectory (see graph below), it will be 10 years before we regain the ground we have lost—or, five times the recovery time we experienced earlier in this decade and roughly three times what it was in the mid-70s. But it may be folly to expect even that level of predictability, as many economists and political scientists warn us that the situation in Europe could cause massive problems here in the U.S. Even without an economic collapse in Greece and Spain, for example, there is concern in Europe, particularly in the U.K., and here that we may face a double-dip recession. Job numbers are sinking (even with hundreds of thousands of people having simply left the labor force), housing foreclosures are rising, and with a national election coming up, it is all but assured that there will be no action from Congress and the White House to take any corrective actions on the economy until after November. This is the headline as far as NPQ is concerned, but the rest is not much better. As we dig into the report, the news appears less than exciting in a veiled sort of way. Let’s start with the “gain” for this year, which amounts to 4 percent or .9 percent in inflation-adjusted dollars. If we were able to “take this to the bank,” it would put us on the tough path we have referenced above, but we can’t depend on this number, necessarily. The Giving USA estimates for the last two years (2009 and 2010) have consistently been revised downward. For the 2009 figures, these revisions represented an 8.26 percent difference between the original estimates and the final and for the 2010 estimates, there was a much more modest revision, amounting to only 1.37 percent. But even a small downward revision to these estimates would mean that we may eventually see that the giving picture is flat or that we have had an actual decrease in 2011 giving, at least in inflation-adjusted dollars. And while we are on that decrease in foundation giving, we do wish to note that there is an odd blip in the way donor-advised funds are categorized. Some of these “gifts” are categorized as giving to foundations and others are categorized within the public society benefit realm because that is where the charitable gift funds like Fidelity, Vanguard and Schwab now sit. 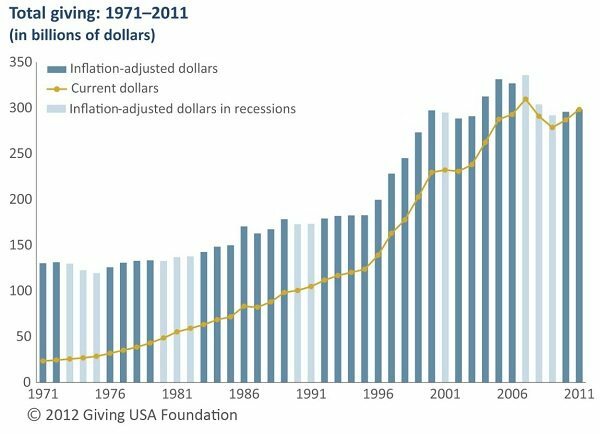 In fact, the gift funds realized an average growth of 77 percent in 2011 over 2010, leaving us wondering, since the field was essentially flat in inflation-adjusted dollars, whether the federated drives like those of the United Way (which are also in that category) saw a significant decrease in their fundraising. If the concern is for the category of giving vehicle which is generating potentially increased volume in giving and the speed from which disbursements of that giving occurs, the various donor-advised funds, whether managed by big mutual fund companies or by the nation’s variety of community foundations, are showing counter-recessionary resilience. It raises the question of whether the analysis needs a more discrete disaggregation of donor-advised funds (and other market-oriented giving vehicles, many of them tabulated in the annual reports of the National Philanthropic Trust) and a better analysis of the kinds of nonprofits that benefit from DAF disbursements. Such an analysis might look at whether giving through donor-advised funds basically tracks the kind of giving that most people make from their personal checkbooks, or whether the vehicle of donor-advised funds changes the kinds of charities that benefit. This represents a dynamic that is a major challenge for nonprofits. Donor-advised funds are immune from nonprofit solicitation and, increasingly, private foundations will not entertain unsolicited proposals. As NPQ has frequently noted, nonprofits have no direct way of submitting proposals to the Schwabs and Vanguards of the world for access to donor-advised fund dollars. Add to that the mega-gifts from donors who know what they want to give to and why without having to sort through several applicants and one finds nonprofits having a shrinking ability to make their case to donors (who are increasingly inaccessible). In terms of interpreting the data, it is worth noting that the giving by corporations, which declined slightly last year (.1 percent in current dollars or 3.1 percent adjusted for inflation), may represent a much larger decline in cash giving than is immediately evident. The report states elsewhere that “Giving to individuals is estimated to have increased 9 percent from 2010 to $3.75 billion. The bulk of these donations are in-kinds gifts of medications to patients in need made through the Patient Assistance Programs (PAP) of pharmaceutical companies’ operating foundations.” This would suggest, if we are interpreting correctly, that the increase of in-kind gifts to individuals means a decline in cash within that reduced corporate giving pool. Is there any good news in the report? International giving has actually increased significantly, which may be a bit of a good news/bad news scenario. The American public, as well as philanthropic grantmakers, deserve much credit for their continuing and increasing charitable generosity on international issues and for overseas work. As we see it, in an era when very long wars in Iraq and Afghanistan do little for the image of the U.S. around the world, American charitable and philanthropic giving is putting America’s best face forward. Even more so, institutional funders have to be credited for pursuing their international grantmaking despite the chilling impact of the Department of the Treasury’s international giving rules, which are designed to deter charitable dollars from terrorist organizations. While engaging with Treasury in a long-running debate over the department’s voluntary guidelines, funders have stepped up their giving and demonstrated how they can do this without running afoul of Treasury concerns here or terrorist misappropriations there. In the end, perhaps these numbers are not as bad as they could have been but they seem worse than the headlines would suggest. Of course, the landscape is infinitely more complex than what we see reflected in charitable giving numbers alone, so for many groups, these numbers are less worrisome than, say, having their state’s mental health budget eviscerated or seeing their lawyers trust fund accounts shrivel to less than a tenth of their previous value. In other words, since charitable contributions are only part of a larger revenue picture for many nonprofits, the impact of the economy on any particular organization and field depends upon the way it affects their various streams of income, rather than just charitable giving. In the arts sector, for instance, museums and performing arts organizations might, over the past few years, have also been negatively affected by recessionary declines in gift shop sales or admission fees and continuing cutbacks in federal revenues through the National Endowment of the Arts and the National Endowment of the Humanities, both of which have faced challenges within the federal budget. If they had facilities, they may have suffered losses in value there as well. And when we look at the relatively revenue-flat picture of charitable giving to human services, we must also consider the reductions in local, state and federal grants and contracts to some fields, as well as—and this adds yet one more factor—the increase in calls for those services. Over the next few weeks, NPQ will dig more into the details of these numbers so keep an eye out for follow-ups.